You're particular about the grits of the water stones that you use for specific sharpening operations, so why would you be any less particular about the lapping plate that you use to flatten those stones? 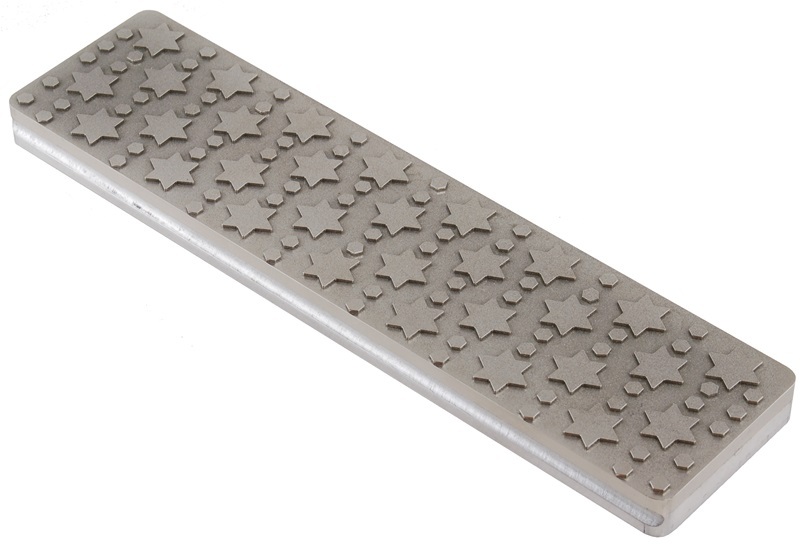 The Nano-Hone NL-5 Lapping Plate is 240mm (9-7/16") Long x 60mm (2-3/8") wide, and it is is designed to flatten water stones from 400 grit to 30000 grit. That's abrasive particle size of 20μm to .5μm if you prefer microns. The NL-5 uses diamond abrasives like some other flattening plates, but with a difference. The diamonds are coated onto raised structures arranged in a specific pattern. The particular pattern used on the NL-5 has long, straight edges, and that's what makes it particularly suited to be used on finer grit stones. The primary cutting action occurs on the edges of the raised, diamond-coated structures. The Star and Hexagon pattern of the raised structures maximizes the number of working edges increasing the number of 'edge-material contact points' for fast but smooth action. Q. If the NL-5 is for finer water stones, what should be used for coarse ones? A. Nano-Hone makes a companion stone to the NL-5. The NL-4 Lapping Plate for Coarse Stones is the perfect plate for stones of 2000 grit or lower.